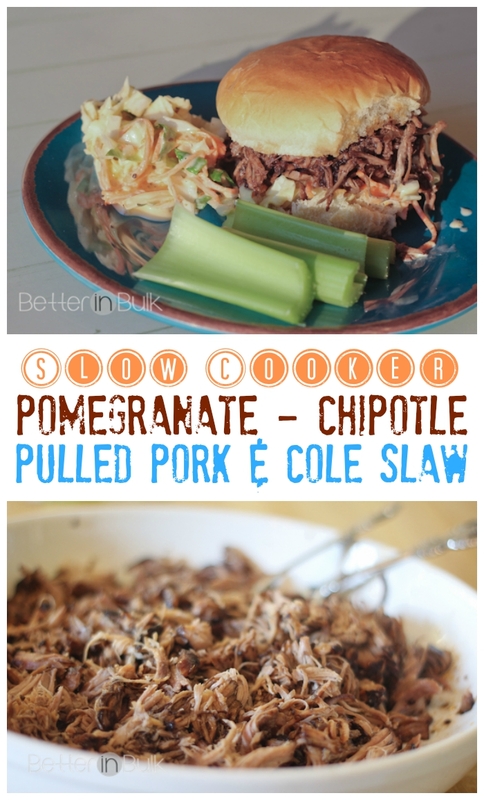 Last year, I discovered a recipe for Chipotle Pulled Pork that was better than I could have ever imagined. As I almost always do, I modified the recipe that I found online to suit my taste and habits (I wanted to cook it in the crock pot instead of in the oven). The crock pot version was easy and absolutely perfect. Brown roast on all sides in a large pan. In the mean time, combine pomegranate juice, lemon juice and sugar in a medium saucepan. Bring to a boil then quickly reduce to the heat to low. Simmer, stirring occasionally, until the mixture reduces to a syrup consistency that coats your spoon, about a half hour or so. Add the rest of the ingredients to saucepan, and continue to simmer until mixture thickens to a barbecue sauce consistency. Place browned roast in the crock pot and pour the sauce over the meat. Cover and cook on low for 7-9 hours. Remove the meat from the crock pot and place it on a large platter. Using two forks, shred the pork and place in a large bowl. Return shredded meat to the crock pot and let it soak in the hot barbecue sauce. 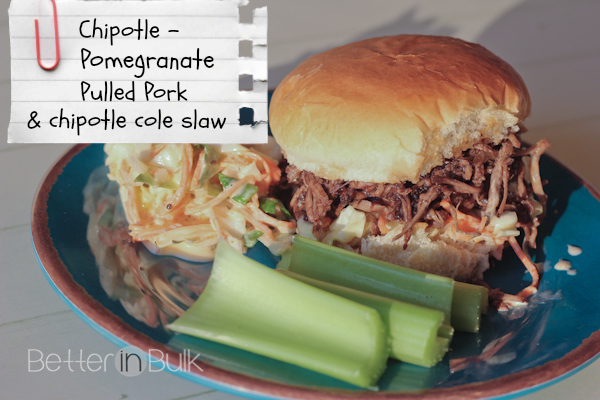 Place meat on buns and top with slaw. Chipotle Slaw This close slaw can be served on top of the pulled pork on a bun, on the side, or by itself. It's a fun slightly spicy version of a classic slaw. 4 cups fresh cole slaw mix or shredded cabbage and carrots, mixed ¾ - 1 cup mayonnaise ¼ cup honey juice from half a lemon ¼ - ½ cup finely chopped red onion 1 teaspoon finely chopped chipotle peppers Mix sauce ingredients and then toss with cole slaw mix. PS – as an extra bonus – I have discovered the secret to tender, pull apart meat in the crock pot. I used to always cook my roasts with potatoes, but I’ve found that potatoes steal a lot of the roast’s precious cooking liquid. Once I left the potatoes out of the crock pot, my meat started turning out more tender…every time! That looks fabulous! I’ll definitely try it soon! Love the idea of pomegranate juice! Amazing! There is nothing better than crispy claw on top of anything pulled…lol Can not wait to try this, thank you!